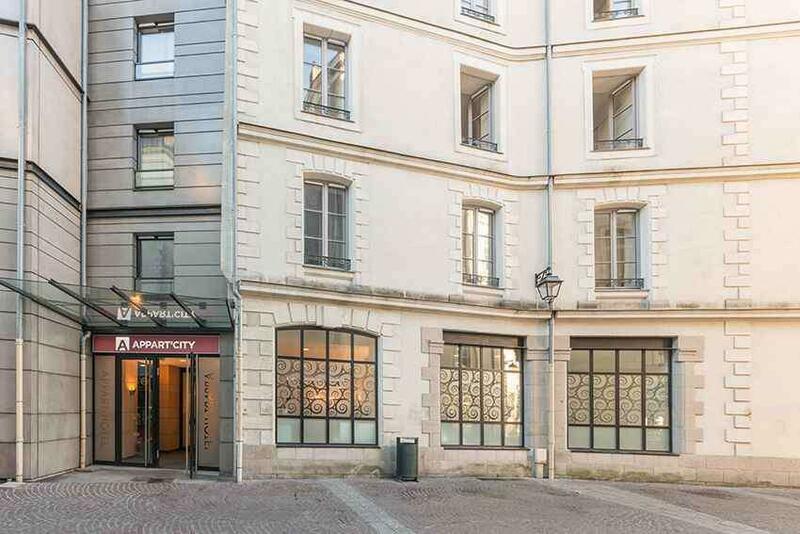 ﻿ Appart’City Confort Nantes Centre Nantes. JIMAT di Agoda.com! Ada soalan mengenai Appart’City Confort Nantes Centre? Ketika melawat Nantes, anda akan merasa seperti di rumah di Appart’City Confort Nantes Centre, yang menawarkan penginapan berkualiti dan perkhidmatan hebat. Terletak hanya 0.1 Km dari pusat bandar, para tetamu berada di lokasi sesuai untuk menikmati tarikan dan aktiviti di sekitar bandar. Penginapan ini berada di sekitar kawasan tarikan bandar yang popular seperti Eglise Sainte Croix, Le Gateau Sous la Cerise, Art Me. Kemudahan dan perkhidmatan yang disediakan oleh Appart’City Confort Nantes Centre memastikan penginapan yang menyenangkan bagi para tetamu. Hotel ini menawarkan pelbagai kemudahan di lokasi untuk memuaskan hati tetamu termasuk yang arif. Semua bilik tetamu menawarkan pelbagai jenis tahap keselesaan. Banyak bilik turut menyediakan televisyen skrin rata, kerusi tinggi kanak-kanak, linen, tuala, ruang tamu asing untuk memuaskan hati tetamu. Di samping itu, pihak hotel menawarkan aktiviti rekreasi untuk memastikan anda mempunyai perkara untuk dilakukan sepanjang penginapan anda. Appart’City Confort Nantes Centre merupakan pilihan yang bijak bagi pelancong ke Nantes, menawarkan penginapan yang santai dan mudah setiap kali. I stayed in unit 102 which I believe is just above a late night club. They were playing loud dance music until 2:00am that kept me up because of loud sounds and vibrations. The hotel provides you with ear plugs which would have been helpful but I needed to be able to hear my alarm in the morning so I couldn't use them. The hotel is in a good area though, lots of food choices and very close to the Gare de Nantes. They not cleaning the rooms and the staff themselfes told me that this is not HOTEL!!! I think it's possible to find HOTEL in good location on the same price !! Bathroom needs repairs. Window doesnt close (also those with dont open sign). Had the 4 bed room on a high floor. Not sure if I received a deal because my bathroom was so bizarre or not but the bathroom was a large room with a toilet and drain for the shower with no divider or curtain. This was the largest room I’ve stayed in during my European tour which was nice. The bathroom was the worst part of my stay. There was no shelves or table, to place items, so I improvised and moved a table in to the bathroom. Once they renovate the bathroom the room would be great! I can tell the hotel is getting renovated which will be nice once the hallway carpets, bathroom, etc. are replaced. It was very quiet which I really enjoyed compared to other hotels. Basically the bathroom was the worst part of my stay. Everything was fine. Some services stated on the hotel's Agoda page is wrong - but when i showed it to the hotel staff, they said "Go complain to Agoda! We know nothing about our Agoda page!" I can understand if there is any technical problem but this is not the right attitude! How can it be none of their business when it is related to their hotel's reputation! They should at least say sorry for the misunderstanding and then ask me to talk to Agoda - very irresponsible and rude staff, and very impatient during check-out too! Some things such as complimentary LAN internet do not exist, check in time is later than stated, they charge for early/late-check out AND LUGGAGE STORAGE. WIFI is of course not free. BAD facilities - lights in the shower were spoilt, old and rusty kitchenware, smelly bed sheets - i got all itchy from just lying on it. This wasn't the first time that I stayed at this hotel. I can't remember how many times already though. The hotel is really clean. The staff are friendly. I think the best part of this hotel is the location. It's located right at the city center. The tram is just a few steps away. Very convenient to go anywhere. The stay was nice. The room was clean. The hotel looks new. Decoration is modern. The location is the best because it's at the city center. the hotel is surrounded by local restaurants and it's only a walking distance to the shopping area. the tram is only a few steps away. the price per night is not expensive. it was worth every single cent! 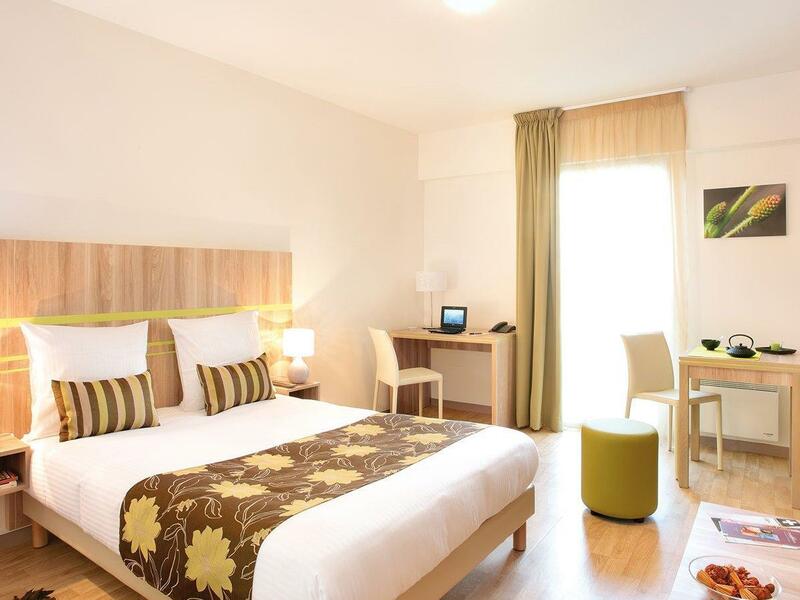 Very idealy located in nantes downtown, the hotel allows to reach each city tourist spots within walking distances. 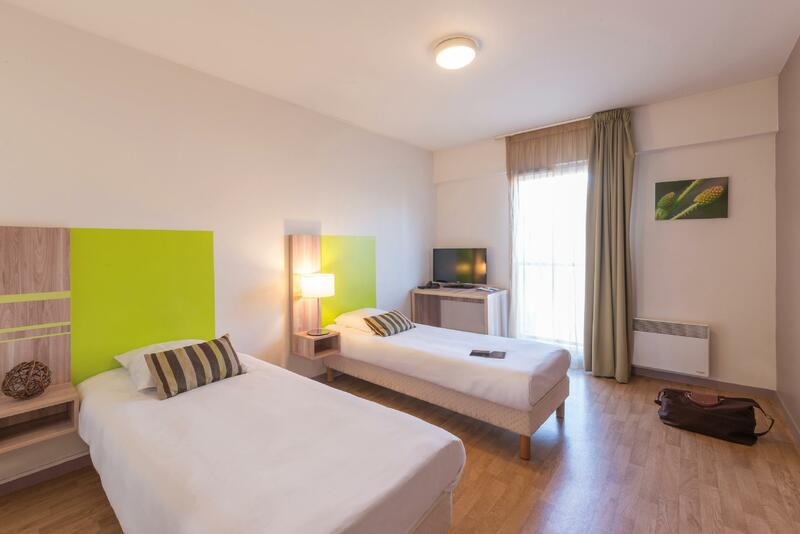 Hotel new and modern, rooms are fully equiped with a kitchne which made them great for both short an dlong stays. prices is really value for money for such location and hotel level. Good, conveniently located next to restaurants and bars but the room itself was quiet. This is a great hotel with nice, new and clean hotel rooms. The hotel rooms have no air conditioning, but are generally well equipped. Wifi connection in the rooms are excellent. The staff are friendly and helpful. The hotel is located approximately 10 minutes from the main train station, and is within tourist area. It is close to all the attractions, and there are restaurants and cafes around. Overall, this is a very good hotel and we will definitely come back to this hotel. Very warm staff, clean and nice looking hotel. Studios are spacious. Only drawback of coming for a single night into such a hotel is that the floors can smell food from other people's cooking. But the hotel is quiet, it has free wifi and I loved the high quality of breakfast, including eggs, bacon, fresh fruits and wonderful croissants. Room price was decent. 13€ for breakfast seemed high, but again, it was worth it. Easy to locate on a map in a central location, but awfully hard to actually find in a car because it is on a street that they close off vehicle access to at random times. So we had to park away and get a local taxi to drop us off after 2 hours of driving around ourselves unsuccessfully trying to get to it. Lovely big modern rooms and facilities in a good central location.... but the pedestrian street the hotel was one is a pub strip.... so they partied until 4am and we couldn't sleep. The room was in the attic and we could hear everything. Admittedly it was a saturday night. But if you want to sleep - not here. SO after the frustration of trying to find the hotel with a car and no sleep, and rather indifference service. Generally a good value hotel with helpful service staff, adequate space and furnishing was tastefully done. Lots of great eateries around the hotel, as well as a convenient supermarket located at the basement of the Galaries Lafayette right around the corner. The Castle of the Dukes was also within short walking distance. Would have been perfect if pillows were more comfortable and the bed could have been bigger. Being located on a street with many bars and eateries also meant that noise levels at night could be somewhat annoying. However, the great location of the hotel was still a major plus point for us. The tram-stop is right outside and getting to the rail station was only a couple of stops away.